Headphone jacks are on the way out, and Qualcomm is looking to cash in on the situation - while also possibly making your headphones sound less bad over USB-C.
As you know, most smartphones shipping without 3.5mm jacks do come with USB-C dongles to act as adapters for the traditional analog port. Most of those phones don't even contain a headphone amplifier at all, though (to save space and money), so those pieces actually go inside the dongle instead of the phone. The problem, unfortunately, is that some of these dongles just don't sound very good. Qualcomm wants to change that, and it's created a part called the AQT1000 to address it. 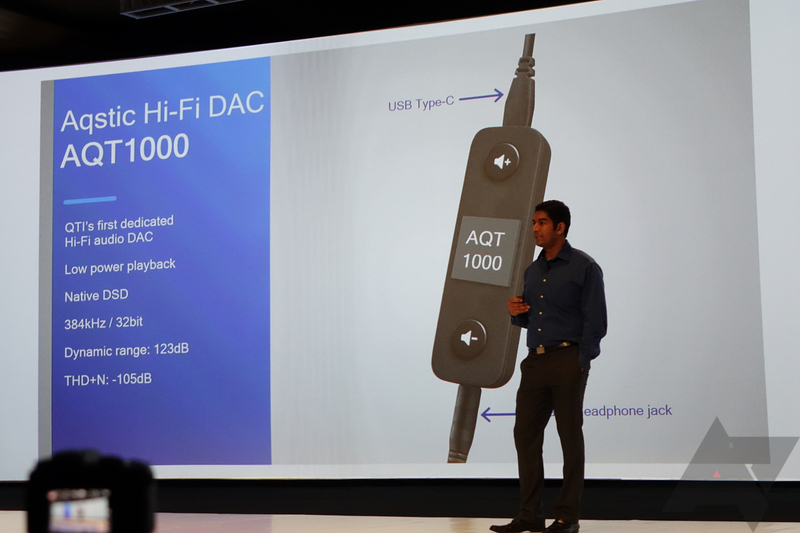 Essentially, the AQT1000 is a highly stripped-out version of Qualcomm's WCD9341 Aqstic audio codec (think DAC+amp). But it's not really all that stripped-out: it supports playback of formats at up to 384KHz and 32 bits, including the fairly obscure DSD format, which is favored by some purists. Qualcomm claims the AQT1000 will have a theoretical dynamic range of 123dB and a THD+N of -105dB, both of which are pretty respectable figures. 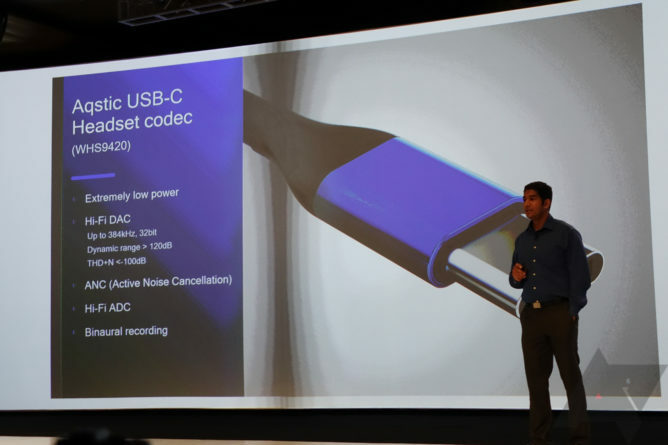 Qualcomm also has developed another part based on the Aqstic codec that will go in USB-C headphones themselves (what few seem to be coming out), promising extremely low power consumption, everything you see above, plus support for active noise cancellation and advanced recording features. You can see information about that part above. 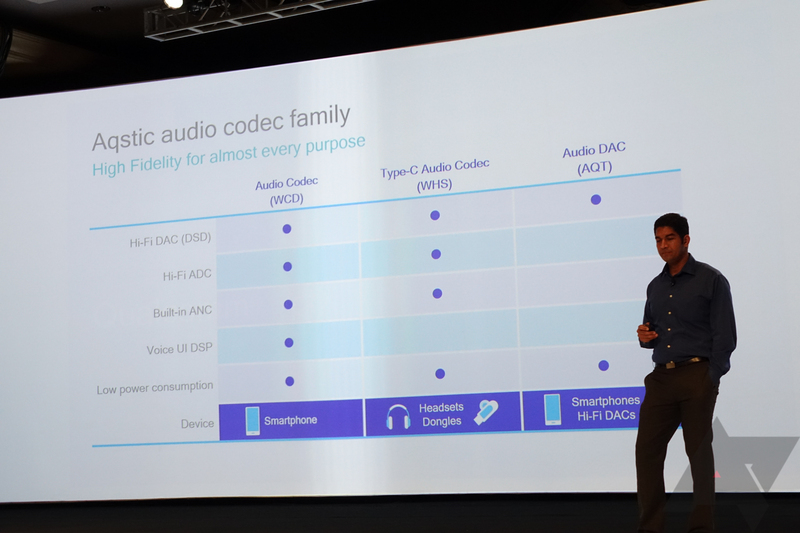 You can compare the feature sets of the smartphone audio codec, the headphone codec, and the DAC codec below - it helps you get a sense of what's being taken out in these standalone applications. Whether manufacturers will bite on the idea of a "Hi-Fi" headphone dongle remains to be seen, though I'm sure there's some kind of market out there for a more capable set of USB-C headphones. With the arcane world of digital audio coming more to light as the headphone jack fades off into the sunset, it does seem likely that some consumers will seek out audio accessories that offer the best possible wired performance. Qualcomm certainly seems to think so, or rather, think that the companies making these things do. I guess we'll have to see how it pans out in the market. Or, you know, we'll all just switch to Bluetooth.